I debated whether or not to do a weekend rewind this weekend. Mainly because I didn't feel like it. But then I had some time on my hands so I figured I would induldge my 7 readers. That's right, I'm pretty sure my daily following of 5 has jumped to 7. Watch our MckMama and Pioneer Woman. Here I come! Ok. I think I've got it. Yes, I remember now. Friday night was spent at home (except for when we went out). I arrived home from work to see C already at home, on the couch, watching Lost. I usually always arrive before him. While he denied it, I think he came home earlier than me so he could claim the t.v. to watch Lost. Dinner was the ever yummy Cheeseburger Pie. I don't think I've ever shared this recipe with you before, so I'll have to add that to the list of things to post. After dinner we went to Starbucks. Now, I usually get a short mocha but they didn't have their cute heart cups in the short size, so I went with a tall. (Isn't this post SO interesting thus far!?!) We then spent the rest of the night watching Lost and the Olympic Opening Ceremonies. I'll let you figure out who watched what. I was not too impressed with the Opening Ceremonies (oops, did I just give it away?) and spent a good two hours tweeting about it with my family (no on else will follow me on twitter). Saturday we slept in before C headed to work and I headed out shopping with my mom and sister (and brother). After hitting up COSI in Bexley we went to Polaris. I purchased some items from Williams Sonoma with a gift card I had. We then watched the Cinnabon guy make cinnamon roles. After Polaris we headed to some quilt store for my mom (I have no idea where in Columbus that was... Clintonville, maybe? 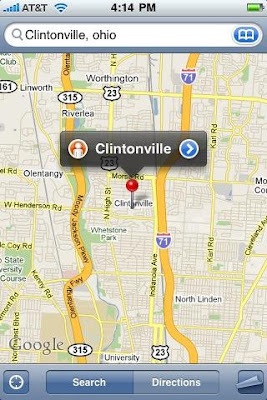 not that I know where Clintonville is) before heading to Madison Christian to drop Mark off at a basketball game. We then picked up our cousin, James, who is a freshman at OSU and took him to dinner at Easton where we met up with the Stephensons, C and my dad. It was a delish meal and was great to see everyone. Saturday evening we returned and didn't watch any Lost (gasp!!!) but did watch the DVR'd NBA All-Star Skills Competition. Sunday I went to church while C went to work. We grabbed some lunch at the Waffle House. Then I spent the afternoon at my parents' house. I watched the Buckeyes, took a nap, braved the roads with newly (temporary) licensed Mark, made some fortune cookies, and had a delish meal (which C was able to join us for). We then returned home and C got caught up on Lost (he's now ready for the weekly aired episodes - thank the Lord!) while I spend a few hours in our freezing office (it is literally several degrees colder in there than the rest of the apartment) watching a quality Disney Channel movie.